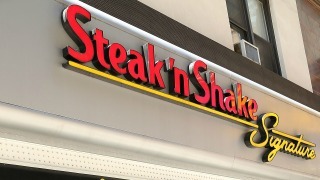 File image of "Steak 'n Shake" sign. Listen up foodies, a new burger joint is on its way to the Bay Area. For those that like juicy cuts of steak hand-pressed into a burger paired with a sweet milkshake to top it all off, Steak 'n Shake will soon be satisfying those cravings on the Peninsula, according to the San Francisco Business Times. The fast-food chain is scheduled to open up its first Northern California establishment in Daly City on Oct. 15, which will add to two other locations that currently call Southern California home, the San Francisco Business Times reported. More than 500 Steak 'n Shake locations dot the map around the nation, mostly in Midwest, and plans are now in the works to open a second Bay Area joint in Campbell, the San Francisco Business Times reported. Aside from a burger, customers can also feast on chili topped over spaghetti as well as steak-styled hot dogs, according to the company's website. The expansion move by Steak 'n Shake comes at a point for big time fast-food expansion in the Bay Area, according to the San Francisco Business Times. Taco Bell, Dunkin' Donuts, Dairy Queen and Checker & Rally's are finalizing plans to continue growth in the region.